*Restylane is a hyaluronic acid based filler, and was the first long-lasing filler introduced in the US market. Hyaluronic acid is a natural material that acts like a sponge under our skin, absorbing moisture. This means it provides a soft, natural fullness when injected into the skin. It also means it is very safe: hyaluronic acid fillers can be dissolved by your doctor if they cause unwanted effects. Results from restylane generally last 9-12 months.  Common injection sites include the lips, where restylane effectively highlights the lip borders, the lower eyes (liquid eyelift), and other areas requiring fine correction. Perlane is a thicker form of Restylane that is ideal for smoothing smile lines as well as adding volume to cheeks. Dr. David exclusively performs Liquid Eye Lifts with Restylane in our San Diego practice. *Juvederm is similar in structure to Restylane, but tends to diffuse slightly more, making it highly effective for plumping the lips. Juvederm is also great for the nasolabial folds or “smile lines.” Like Restylane, Juvederm is mixed with lidocaine for a comfortable injection. In addition, a topical anesthetic is commonly applied for ten minutes to the treatment area. Juvederm is also a hyaluronic acid based product, meaning it can be dissolved if necessary. Side effects are minimal and rare, but include over or under correction, bruising, swelling, lumpiness, and discoloration. *Sculptra is a unique filler that is composed of particles that are also found in dissolvable sutures. It is also a bio-stimulant, so our body responds to it by laying down collagen. Sculptra can be used over large areas of the face, such as the cheeks, temples, jaw line, etc. The best thing about Sculptra is that results may last 2 years or longer! When many clients in San Diego think of liquid facelifts, they think of Sculptra, because a bottle of Sculptra can be used on a large area of the face as opposed to a single line or wrinkle. As our understanding of facial aging has evolved, we now know that be enhancing the cheeks, temples, and jaw line with fillers we can impart a more natural, beautiful look for our clients. Sculptra allows us to treat all these areas effectively. *Sculptra is purchased by the bottle, with most clients starting with one to two bottles for smaller areas. It is mixed with lidocaine for comfort, and a topical numbing gel is also applied. Like all fillers, bruising is possible with Sculptra but usually mild when cold compresses are applied. There is no need for downtime, and patients can immediately return to work in most cases. Nodules under the skin are possible, but usually can only be felt and not seen. These have become rare in our practice. Sculptra is composed of poly-L-lactic acid, a material that has been used for years in absorbable sutures. I acts as a bio-stimulant, causing our bodies to deposit collagen which lasts for years after the Sculptra has dissolved. Several hours after your Sculptra treatment, you will look as you did before treatment. Over the next several months, as collagen builds, you should begin to notice the improvement. Unlike the hyaluronic acid fillers, radiesse is comprised of calcium hydroxylapatite spheres that act as stimulants. Our body responds by laying down collagen, providing a long lasting and firm support for the skin. Results from radiesse may last up to one year. Radiesse is ideal for deep smile lines, hollow areas around the corner of the mouth, as well as the cheeks and temples. Each filler requires slightly different injection techniques, and our doctor and nurse injectors have the experience and skill to help you choose and implement the best filler, or combination of fillers, for particular case. No longer widely available and essentially replaced by longer-lasting fillers such as restylane, juvederm, and radiesse, collagen is no longer used in our practice as an injectable filler. *Artefill is considered a permanent filler. It is injected into moderate to deep smile lines to provide long-lasting correction. A skin test is required prior to treatment to test for sensitivity. We have safely used artefill for many years in San Diego with high client satisfaction and no complications, however possible risks include granulomas or lumps, extrusion, and even allergic reaction. Often, clients will request artefill after trying other fillers and realizing they want a more lasting solution. The most common area for injection is the smile lines, with most patients requiring one to two syringes. Voluma was introduced to the market in 2013 and is FDA approved to provide up to two years of correction for volume loss in the midface. The midface is a critical area to volumize in the face, because it anchors the eyes, cheek pads, and even the smile lines and jaw line. Voluma is very viscous and highly cross-linked, giving it the strength to support heavy tissues of the cheek area. Dr. David was one of the first plastic surgeons in San Diego to obtain Voluma and is highly experienced and sought after for this filler. Voluma may cost more than other fillers, but the extended duration and safety of this product make it a top choice for many of our clients. Voluma is a hyaluronic acid based filler, meaning it works by absorbing water to bring moisture and fullness to the treated area. Like all HA fillers, it can be easily dissolved with hyaluronidase if clients are dissatisfied for some reason. Commonly treated areas in our practice for Voluma include the cheeks, smile lines, jaw line, and temples. Contact us today to schedule a consultation to see if you are a candidate for Voluma!